“The Arctic is heading for a train wreck” and the window to confront the worst of these changes is narrowing, say scientists behind a recent report. Here is what we can do. A new report (SWIPA) on the state of climate change in the Arctic highlighted some key changes that are already under way. Their effects may be felt throughout Europe and the USA and the window to avoid the most extreme changes is narrowing. Here are four of the key changes highlighted in the report and then, what we can do about them. One of the key findings of the report is the continued decline in Arctic sea ice since satellite observations began in the mid 1970s and the prospect of a largely ice-free Arctic Ocean in summer just 20 years from now. “The diminishing sea ice will re-shape the world biogeophysically and politically. This could make the Arctic a very different place by mid-century,” says report co-author William Colgan, a glaciologist with the Geological Survey of Denmark and Greenland (GEUS). The effects of this continued decline in sea ice are already being observed. Species are moving into new habitats as more of the Arctic Ocean becomes ice-free for a longer part of the year, while other species that depend on the sea ice, including some seals and polar bears, are losing their feeding grounds. Algal blooms are becoming more frequent and many marine species are changing their diets as a result, with knock on effects for predator-prey relationships and migration patterns. An ice-free Arctic Ocean opens up new shipping routes and fisheries, while coastal communities around the Arctic are already experiencing coastal erosion due to choppier, open seas. Read More: When will the Arctic be ice free? Rising global sea levels presents an immediate and long-term challenge across the globe. Melting land ice from the Arctic region has contributed almost 40 per cent of the 28 centimetres global sea level rise that has already occurred since 1850, and much of this is from the Greenland ice sheet. This is set to continue, with many smaller glaciers in Russia and Siberia predicted to disappear entirely by the middle of the century. “Sea level rise makes a hundred year event into a 20 year event with only a small rise in sea level, a rise that has been observed around Denmark,” write climate scientists Ruth Mottram and Christian Roedhacke from the Danish Meteorological Institute, in an article for ScienceNordic. The report reviews the results from scientific publications covering all aspects of climate and environmental change in the Arctic since the last SWIPA report in 2011. Written by 90 scientists from the Arctic Monitoring and Assessment Programme (AMAP). Peer reviewed by 28 independent experts. Estimating the exact consequences around the world is difficult as it depends on how many people live there, what industries and infrastructure exist, what flood defenses are put in place, whether they are maintained, and of course, how much sea level rise actually happens. But as a guide, the UN IPCC estimate that 0.5 metres of sea level rise would leave more than 120 million people and 35,000 billion USD worth of assets exposed to such a one in one hundred year flood event by 2070. That compares to 39 million people in 2005, measured in 136 large coastal cities. Biggest loses are estimated to be in Asia and Europe. Read More: Sea level rise: How far and how fast? Since the last SWIPA report came out in 2011, evidence has been mounting that a warmer Arctic, declining sea ice, and melting land-ice are changing the properties of the Arctic Ocean and atmospheric circulation, and this has climate scientists worried. “The well-documented drop in sea ice is certainly a major concern. Not only will it impact local habitats, it will also likely have a major impact on global climate,” says Professor Marit-Solveig Seidenkrantz, a climate scientist from the Arctic Research Centre at Aarhus University, Denmark, who was not involved in the research. It could influence ocean circulation, slowing down or even shutting off the current of warm water in the Atlantic Ocean that flows to Europe. This could make our future weather more chaotic. Read more: Is a vital pattern of ocean circulation about to shut down? A warmer Arctic and declining sea ice also allows the so-called polar jet stream to change from a fast flowing band of winds in the upper atmosphere, to a weaker, wiggly flow. This changes the strength and patterns of storm tracks that flow across the northern hemisphere, where pockets of highly variable weather conditions can develop. This phenomena, sometimes called “global weirding,” has already been observed numerous times in recent years, with unusually cold or warm weather, flooding, snow, or drought in the USA, southern Greenland, and Europe. See how retreating sea ice and land ice in Greenland could be linked to climate change outside the Arctic in the interactive map. The SWIPA report also highlights recent evidence that these changes in the Arctic can even reach all the way to Southeast Asia, where they have been linked to changes in the onset and the amount of rainfall during monsoon season. But the SWIPA scientists emphasise that they still do not have a firm handle on the precise nature of these connections or how they could change in the future. “I’d say that the biggest threat is from these unknown effects on ocean circulation. We’re flooding the North Atlantic with fresh water and we really don’t understand this so well.” says Box. Ruth Mottram from the Danish Meteorological Institute agrees. “This is still an area of active research with a lot of work to do to clarify what the key feedbacks are. It’s definitely one to watch in the future,” says Mottram. Thawing permafrost is already causing problems throughout the Arctic. And this is set to continue over the next 30 years. 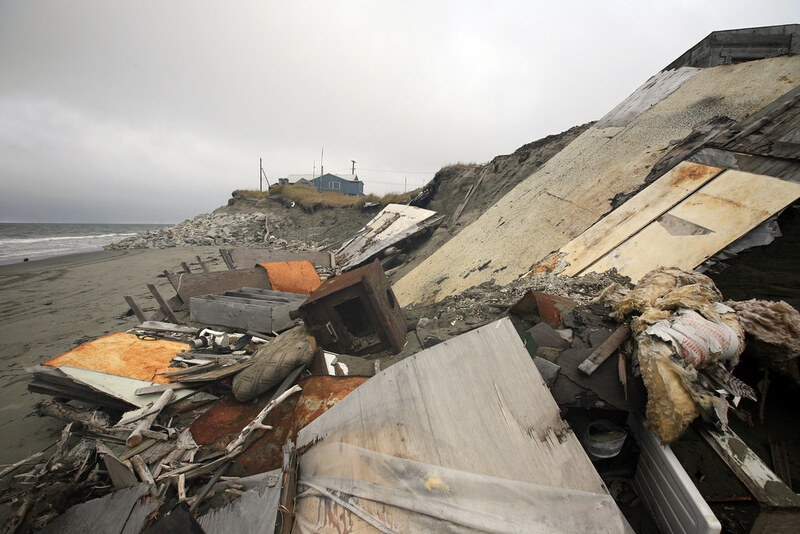 So far the biggest challenges are to the towns, communities, and industries building on the permafrost as it thaws and subsides. And pollution could also be problematic for farms and local communities, if the once frozen waste becomes mobile and spreads into rivers, lakes and soils. “From a cultural perspective, archaeologists have also told me that [they’re already] experiencing the loss of valuable archeological samples that are preserved in the frozen soil but which start to degrade when they thaw,” says Siedenkrantz. But is there an even bigger problem in the form of vast quantities of greenhouse gases (methane and CO2) locked away in permafrost both on land and under the sea? Around 50 per cent of all soil carbon is currently held in Arctic permafrost, which could be released as the Arctic warms. But so far only a small amount of this frozen greenhouse gas has been released into the atmosphere and will lead to 0.2 degrees Centigrade warming by 2050, says report co-author Torben R. Christensen from Aarhus University, Denmark. “Compared to the five degrees that is expected from man-made CO2 emissions, it’s very little,” says Christensen, and adds “It’s not that it’s not important. It’s an extra factor. But what the politicians need to know is that it is man-made CO2 emissions that are controlling climate change,” he says. Learn more about the greenhouse gases locked away in permafrost in the video below. To see what our options are for limiting Arctic climate change, the SWIPA scientists compared two different scenarios. The first follows a scenario where we cut greenhouse gas emissions approximately in line with the Paris Climate Agreement. And in the other scenario, greenhouse gas emissions continue unabated, in a so-called “business as usual” scenario. In both scenarios the Arctic changes in basically the same way for about 30 years. Sea level and temperatures continue to rise, while land ice and permafrost continue to shrink. But after this things change. “It’s not until mid-century that we notice the difference between business as usual and the Paris agreement. But that investment is a good one,” says Box. Presenting the results in this way shows the important choices ahead, says Mottram. “The scenario matters--mitigating our greenhouse gas emissions will significantly reduce the effects of climate change in the Arctic,” says Mottram. “To paraphrase SWIPA, the Arctic is heading for a train wreck, and the scientific community is encouraging politicians to explore options for maximum brake before impact,” he says. A number of smaller reports were released alongside the SWIPA climate report. They outline the key challenges that each region of the Arctic will face and the steps that they can take now to prepare for these changes. A summary of the challenges and opportunities expected in Greenland can be found in the Fact Box. One priority for Greenland should be to prepare the health system to cope with existing and emerging health problems, they write. Such as the emergence of new bacteria and viruses as the Arctic warms. Key to addressing issues related to sea ice decline and retreating land ice will be improving and refocussing the education system. “Strengthening the education system will prepare people to exploit economic opportunities that might accompany change. Language programs would be particularly useful in Greenland, where English is often a third language,” write the scientists behind the regional report on challenges and adaptation in the Baffin Bay region of east Canada and west Greenland. Improving language skills opens up new forms of on-line distance learning that can complement the local education system, and prepares people for new careers in industry such as mining and tourism. But crucial to this will also be preserving traditional forms of education. “Climate change is undermining some aspects of this knowledge, such as the ability to forecast weather conditions and predict animal migrations. However, it is making other traditional skills even more important—such as the ability to identify hazard precursors, survival skills and knowledge of animal behaviour,” they write. The Arctic will change no matter what we do. But implementing the Paris agreement can avoid some of the biggest changes, according to the SWIPA scientists. Stabilize average annual Arctic temperatures at approximately five degrees Centigrade above the 1986 to 2005 average. Reduce global sea level rise by 20 centimetres between 2006 and 2100. Stabilise near-surface permafrost extent at 45 per cent less than today. Average annual Arctic temperatures likely to reach 12 degrees Centigrade above the 1986 to 2005 average. Global sea level continues to rise to an estimated 74 centimetres by 2100. Duration of snow cover continues to shrink to 20 per cent less than today by 2100. The geographical extent of near-surface permafrost could shrink to two thirds its current level. Beyond emission cuts SWIPA scientists also recommend increasing and expanding programs to monitor all aspects of the Arctic environment. These data are necessary to improve projections of near-term changes for example in sea ice, local weather, permafrost thaw, and animal and plant responses to climate change and to implement local adaptation plans. For example, to identify permafrost regions at risk of thaw and research into suitable building and infrastructure adaptations or replacements.